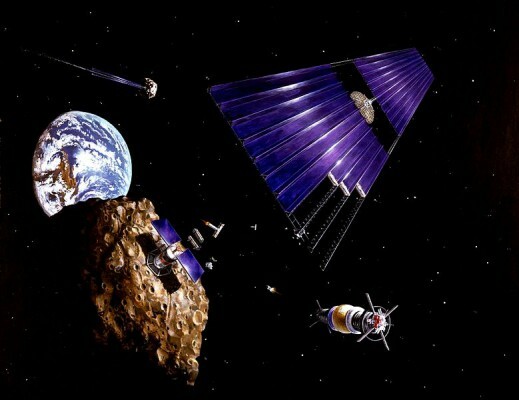 Space mining has become a general conversation topic following an announcement by some Google multi-billionaires, space flight engineers and other investors that they plan to put this erstwhile flight of fantasy into reality. What’s more, the Russians may join them in the venture. To some, space-mining still sounds like a far-fetched idea (pardon the pun), but to others, advances made in technology are coming through so rapidly that what was unthinkable yesterday could become a reality tomorrow. A number of generations ago , everyone still thought that the world was flat but this perception changed very quickly when European navigators, sailing around the world in search of spices and precious metals discovered that the world was round instead. Space mining, also referred to as asteroid mining, will require exploration of a similar but far more complicated kind and therefore not be a plain-sailing exercise. In fact, the subject has been discussed seriously for more than 100 years following the first mention of it in 1989 in Garrett P. Serviss' story” Edison's Conquest of Mars” in the New York Evening Journal. But that was pure science fiction: it was legendary Russian rocketeer Konstantin Tsiokolvsky who first articulated the concept in 1903 and, as we all know, it has been infused since with a multitude of space discoveries made during what we now call the Space Age. It is now also common knowledge that most commodities mined from the Earth's crust came originally from the rain of asteroids that hit the Earth more than four billion years ago. That was when the world was still a melting pot, but like the asteroids, it congealed from the same starting materials, its massive gravity pulling in all these heavy elements into the planet's core. Earth then formed a crust depleted of such valuable elements until more asteroid impacts re-infused the depleted crust with metals. There are now scientists who speculate, on the basis of known terrestrial reserves and growing consumption in developing countries, that key elements needed for economic and technological progress , including antimony, zinc, tin, silver, lead, indium, gold, and copper, could be exhausted on Earth within 50–60 years. So what’s the alternative? There are millions of asteroids in the main asteroid belt between Mars and Jupiter, some as large as small moons. But there are also a million more so-called near-Earth asteroids that have drifted from the belt and assumed stable solar orbits much closer to us. Over the years, scientists have suggested that minerals and volatiles could be mined from an asteroid and then taken back to Earth or used in space for space-construction materials. Materials that could be mined or extracted include iron, nickel, titanium for construction and water, to be broken down in liquid oxygen and liquid hydrogen, to sustain the lives of prospector-astronauts on site, as well as hydrogen and oxygen for use as fuel for orbiting propellant depots, solar-power satellites and space habitats. In 1997 it was speculated that a relatively small metallic asteroid with a diameter of 1.6 km (0.99 mi) contains more than US$ 20 trillion worth of industrial and precious metals. A comparatively small M-type asteroid with a mean diameter of 1 kilometre (0.62 mi) could contain more than two billion metric tons of iron–nickel ore, or two to three times the annual production of 2004. In 2006, the Keck Observatory announced that the binary Trojan asteroid 617 Patroclus, and possibly large numbers of other Jupiter Trojan asteroids, consist largely of water ice. Similarly, Jupiter-family comets, and possibly near-Earth asteroids that are defunct comets, might also economically provide water. Space exploration and satellites have led to commercial ventures. Typical examples of entrepreneurship in this respect are Amazon's Jeff Bezos, Virgin Airlines' Richard Branson, Microsoft's Paul Allen, SpaceX's Elon Musk and others who have all joined the Space Age business and industrial fraternity either by sending tourists into space or by building rockets to launch satellites and other spacecraft for NASA, the Pentagon or private groups, obviously to make more money out of it than they already have. Now take this a step further. On April 24 this year, a number of Google multi-billionaires supported by physicists, former NASA technical staff and an astronaut hosted a press conference at the Seattle Museum of Flight to announce that they were going into the business of space mining — harvesting the nearby Earth asteroids for iron, nickel, platinum, zinc, aluminium, gold, water and more. The company, Planetary Resources Inc.is based in Washington state and has been working with NASA and private companies since 2009. It is co-chaired by Google billionaire Peter Diamandis (author of Abundance: The Future Is Better Than You Think) who helped finance SpaceShipOne, the world's first private spaceflight, as well as Google chief executive Larry Page, former Microsoft executive and space tourist Charles Simonyi, former Goldman Sachs head John Whitehead, and Eric Anderson, founder of Space Adventures, the company that brought a lot of millionaires to space. Google's chief executive Larry Page is also involved and so is a Texan businessman Ross Periot Jr. who is also a big aerospace fan and the first guy to go around the world in a helicopter. Also part of the backing team are film director and ocean explorer James Cameron and Tom Jones Ph.D., a planetary scientist and veteran NASA astronaut. Between them all they’ve kicked in about $50-billion to start the venture. The company headquarters in Bellevue, Seattle, already employs a team of 25 engineers, including chief engineer Christopher Lewicki, who worked at the Jet Propulsion Laboratory on NASA's Mars rover missions. They claim they will "add trillions of dollars to the global GDP" and "help ensure humanity's prosperity" by mining asteroids for water for rocket fuel and rare metals like gold and platinum. Last month, the Moscow Times quoting Ilya Golubovich, managing partner of the venture fund, reported that a Russia-linked company called I2BF Global Ventures had invested an undisclosed amount in Planetary Resources. Michael Murray, a consultant for Planetary Resources, has since confirmed the report. Golubovich did not disclose the amount of the investment but said it was less than "tens of millions of dollars." He added that the company would also participate in Planetary Resources' future investment rounds.I2BF Global Ventures intends to invest more than $50 million — up to 25 percent of its funds — in the space industry, Golubovich said. Golubovich, a Russian-born investor who lives in London, is the son of Alexei Golubovich, the founder of Arbat Capital and a former top executive of the now defunct oil company Yukos. New York-based I2BF Global Ventures focuses on venture capital investments in the U.S. and Russia. But it won’t be easy. As with terrestrial mining, the process of space mining starts with exploration (finding and getting to the sites), then prospecting for the viability of mining operations, then extracting the ore by various means and finally transporting the ore to a nearby facility for refining or beneficiation and for further transportation back to its final destination. Getting into space, is a costly affair but Musk's SpaceX is set to drive down the cost of launches and boosters. Once up there, approaching and leaving an asteroid is said to be a comparatively easy thing to do. While a spacecraft landing on a large outer space body like the moon or Mars will require powerful engines to overcome the forces of gravity, an asteroid’s grip or pull effect requires very little propellant to settle onto it or leave it. Likewise, a load of freshly mined asteroid ore will weigh just a fraction of what it would on Earth. Bringing the payload back to earth, is probably the most difficult part. An important factor to consider in target selection will be orbital economics, in particular the change in velocity (Δv) and travel time to and from the target. More of the extracted native material must be expended as propellant in higher Δv trajectories, thus less returned as payload. Planetary Resources admit that, in order to be successful, they will need to develop technologies that bring the cost of space flight down. So they are taking it step by step. One of the main resources they are going to mine is water to be used for fuel. Anderson and Jones argue that, by mining this fuel on near-Earth asteroids, the cost of space travel will be cheap. They plan to establish space gas stations for solar system exploration. Machines would heat up the asteroid material so water evaporates and gets captured for its separation in hydrogen and oxygen. In fact, they plan to create the first fuel depot in space by 2020, and the fuel could be shipped to Earth or into orbit for refueling commercial satellites or spacecraft. But now comes the crunch. The second resource is precious metals. The team says they want to make precious elements abundant. They argue that just like aluminium was a rare metal at one stage it is now one of the core building metals in the world. They want to do the same with platinum, gold and other rare elements which would allow for technology never seen before. "Scarcity is contextual and technology is an abundance-liberating force. We're going to bring the solar system within our economic sphere of influence." The equipment they plan to design and construct comes in the form of three generations of spacecraft to be launched from new launch platforms, like SpaceX's Heavy Falcon rockets. 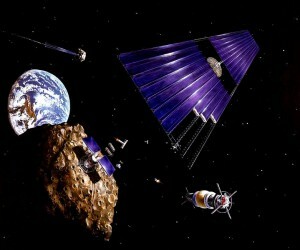 The first will be the low-cost Arkyd 100-series of orbiting telescopes, to look for mineral-rich asteroids. They will be set in low-earth orbit to locate the asteroids. Diamandis reckons the first of these telescopes will be launched by April 2014. They are already building the Arkyd probes in Bellevue, Seattle, and will be launching them alongside other satellites. Meanwhile, they will be working on the second generation - the Arkyd 200-series of prospecting robots. They will use these self-propelled prospectors to study and understand the asteroids - how big they are, their spin rate, their speed, etc. and then analyse their components. Once they have catalogued those asteroids and decided which ones to mine, they will launch the Arkyd 300 series of actual extractors or mining robots. Jones, who also studied near-Earth asteroids, believes some asteroids will not even require actual mining, as they are groups of rubble loosely held together. He said a machine could grab this material to bring it back to Earth. According to Lewicki they were going to be able to make these space mining robots for “single-digit million of dollars” . He also claimed that their missions would be in the” two-digit million” numbers basically using high-speed, high-risk development of spacecraft. Needless to say is that since the announcement the plan has been met with scepticism by some scientists who do not see it as cost-effective, considering the fact Individual robot probes to Mars go for a few hundred million dollars each. The current NASA Dawn mission will top out at about $450 million when it's finally done with its work. The next NASA mission (OSIRIS-REx) to return just 60g (two ounces) of material from an asteroid to earth will cost about US $1 billion. Henry Hertzfeld, professor of space policy at George Washington University, told the New York Times: "If you're involved in an operation of that sort you're going to have to figure out a new and reliable way of maneuvering and manipulating large objects." He and other critics have also pointed out that the venture is subject to The Outer Space Treaty of 1967, which deals with claiming ownership of space assets and using them to one’s tactical or economic advantage. Other scientists have warned that knocking or blasting a near Earth asteroid out of its orbit could have disastrous results for the world.